NET4GAS reference letter — CEPS a.s.
We appreciate the recognition that company NET4GAS expressed to us for cleaning, calibration, hydrostatic tests and drying we have carried out on the DN 1400 Gazelle. 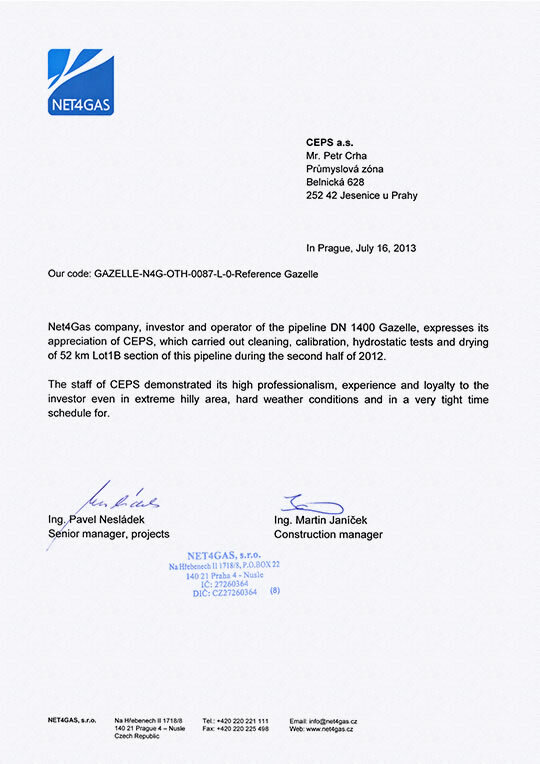 Net4Gas company, investor and operator of the pipeline DN 1400 Gazelle, expresses its appreciation of CEPS, which carried out cleaning, calibration, hydrostatic tests and drying of 52 km Lot1B section of this pipeline during the second half of 2012. The staff of CEPS demonstrated its high professionalism, experience and loyalty to the investor even in extreme hilly area, hard weather conditions and in a very tight time schedule.